India is highly sought after in the field of offshore outsourcing, which has become a strategic necessity for organizations that are growing or trying to reduce their overhead expenses. It is looked upon by many companies as a way to create a base in a foreign land, where they wish to expand their operations, and the outsourcing arrangement as a means of testing the grounds. Its visibility has encouraged more conservative companies to experiment with offshore outsourcing for competitive reasons. Broadening of the IT services offered by offshore companies like Wipro and Infosys. The establishment of captive offshore centers by user companies for their business processes. Onshore IT technology and service vendors setting up shops in countries like India and China. Why consider offshore outsourcing to India? Just as the Persian Gulf has great natural reserves of crude oil and South Africa has the world's most productive diamond mines, India has an abundance of technically skilled manpower. It is the world's second largest exporter of software after the US, and has more software companies with ISO 2000 certification than any other country in the world. According to the National Association of Software & Service Companies (NASSCOM), almost half the Fortune 500 companies now use Indian software services. A growing number of firms are expanding their offshore initiatives in India and several large M&A deals are being scripted in the industry. 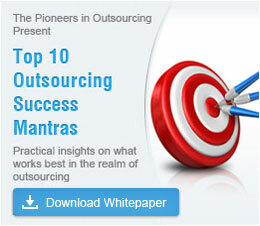 A World Bank-funded study confirmed that vendors rated India as their number one choice for offshore outsourcing. The future of offshore outsourcing looks bright and it will only grow with time. Even small businesses are using offshore outsourcing to make themselves more competitive, especially in markets which are currently dominated by large corporations. According to a study, more than 1.3 million additional Western jobs will vanish by 2015 due to the accelerated movement of work to India and other offshore locations. Looking for an offshore outsourcing firm? Outsource2india (O2I) offers call center services, data entry services, engineering services, finance and accounting services, creative design, web analytics services, healthcare BPO, photo editing services, software development, research and analysis services and a host of other additional services at a cost-effective price. India has won its spurs as the world's outsourcing destination of choice. Indian outsourcing firms strive to ensure smoother functioning of client services, reducing risks and increasing the effectiveness of their services, making India the most preferred offshore destination. Nandan Nilekani, Ex. CEO of Infosys, points out that the way business is being conducted is changing with time: The perfect formula two years ago is no longer the way to do business today. Now the mindset is changing from a company that simply provides services, to one that provides solutions. Google's decision to set up an R&D center in Bangalore speaks volumes about India's appeal, since it is known for hiring graduates only from the very best schools, and this move was surely motivated by the vast technical talent pool that India offers. As reported by Computerworld, 'The number of H-1B visas that can be issued annually is capped at 65,000... but while the total available visas remains constant, the number issued to the major offshoring vendors is rising. The four largest H-1B recipients last year are all based in India, Infosys, Wipro, Satyam and Tata.' As forecasted by some analysts, more than 80% of the world's business process outsourcing services will be served by Indian companies by 2020.